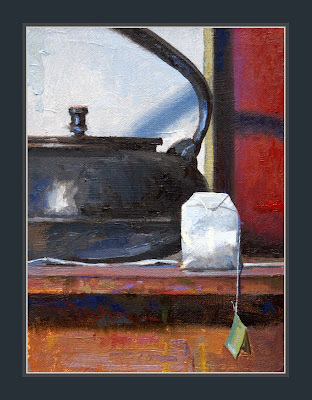 SOLD - Earl Grey - This painting allowed me to explore the beautiful colors that were contained in this black tea kettle, color is in everything. I like the contrasting strength of the iron kettle against the soft and transparent paper that structures the tea bag. Hi Dan, Found you through Carol Marine's blog list. I really like your strong designs, wonderful landscapes. Just scrolling happily through your posts, but this one stopped me in my tracks..love it!